The gym was packed, and the boys began their intense warm-up, practicing their jump serves, passes, sets, and spikes. As the time came Colm Guyn, Deman Dulat, Philippe Piche, Braden Cok, Matthew Mawdsley, and Aidan Simone got to their places on the court. Simone began the first set with a jump serve catching the Rams off guard. He scored the first point and jump serves again. However, this time the Rams reacted fast enough to save, set, and spike the ball. Simone was able to platform the ball but gave the Rams another chance to attack. The Warriors were able to save the ball, and give Simone the chance to spike and score. It was the Warriors’ turn to serve. Mawdsley did a jump serve, but the Rams saved the ball and spiked it at the Warriors. Dulat made a miraculous save and spiked it with an assist from Cok for an amazing point for the Warriors. It was then Cok’s turn to jump serve. The boys stood lined up in the center as Cok made his jump serve; as if they knew he was going to score. The Rams managed to keep up with the Warriors until they were six points behind. With a score of Warriors 16 and Rams 10, the Warriors pretty much took over the set. Mawdsley jump served and the Rams saved the ball but left it too close to the net for McConkey to spike it right back, giving the Warriors another point. Despite the timeout called by Ryerson, Mawdsley managed to score another two points during the set. The Warriors finished the set with a score of 25-13 and continued to win the next consecutive sets with a score of 25-21 in the second set and 25-19 in the third set. Noted by Warriors Athletics; Cok was crucial in the win against the Ryerson Rams, with 18 points on 17 kills and two assisted blocks. Simone had 9.5 points on five kills and five blocks. McConkey had seven kills and a winning kill on match point. Mawdsley had 10.5 points and seven blocks. Guyn had 32 strong and solid assists. The boys wrapped up 2017 with a solid three set game. 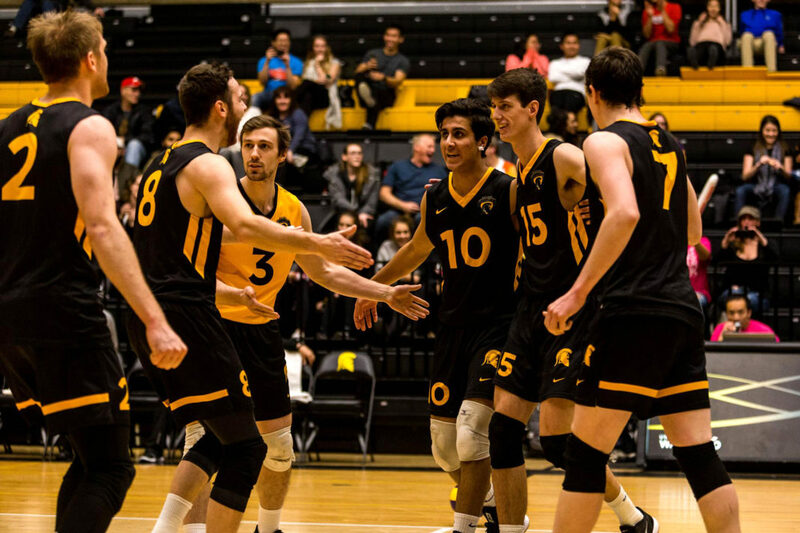 Catch the men’s volleyball team playing their next home game on Jan. 20, 2018 against McMaster at the Waterloo PAC Gym.